There's also a sweater for Sprite underway. She picked the yarn out herself, pulling it off the yarn store shelf and refusing to exchange it for any other. That was a surprise; she usually wants them all. Perhaps she's part cat, because she finds yarn very enticing. And, of course, with one good tug she can (and has) undone hours of work. But, the sweater is coming together anyway, and with the bulky yarn I actually make a lot of progress despite my limited knitting time. I'm not in love with the sweater, though. 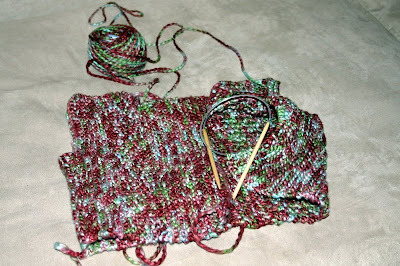 I think, despite the fact that I'm drawn to it in the skeins, variegated yarn is a mistake when I'm making a sweater. Perhaps the busy color scheme distracts from the pattern of the sweater itself? I'm not sure, but I am noticing that I only like muted variegated yarns when I'm working on something larger than, say a sock. But, my girl still plays with the yarn every chance she gets, and I suspect she is going to love the sweater. So, I'll finish it and then try the pattern again in something a bit quieter.